Download "Adaptive Discriminating Detection for DDoS Attacks from Flash Crowds Using Flow. 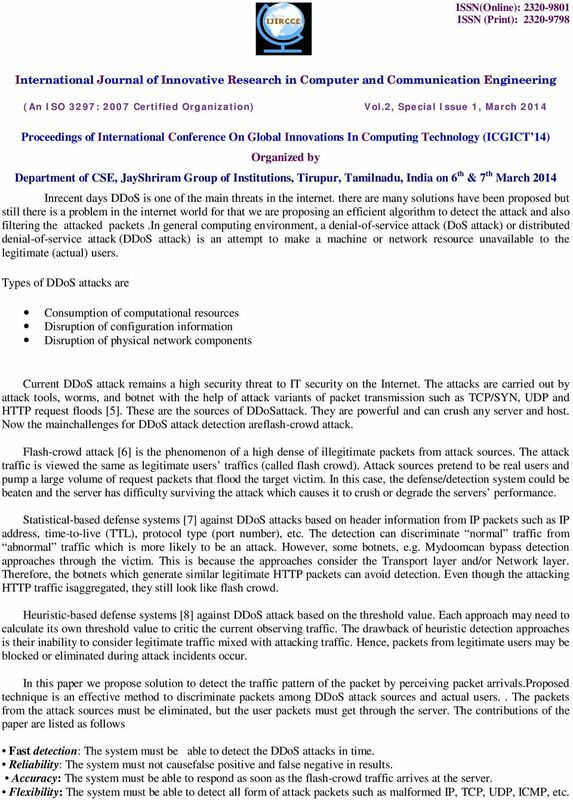 Feedback"
1 Adaptive Discriminating Detection for DDoS Attacks from Flash Crowds Using Flow Correlation Coeff icient with Collective Feedback N.V.Poorrnima 1, K.ChandraPrabha 2, B.G.Geetha 3 Department of Computer Science and Engineering. K.S.Rangasamy College of Technology, Tamilnadu, 1, 2, 3 India ABSTRACT: A Distributed denial of service (DDoS) attack is a most popular and crucial attack in the internet. Its motive is to make a network resource unavailable to the legitimate users. Botnets are commonly the engines behind the attack. 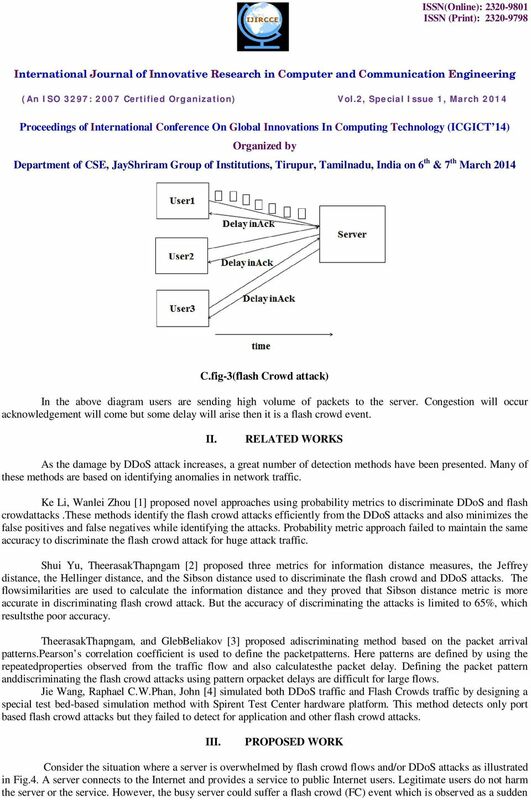 In our deep study of the size and organization of current botnets, found that the current attack flowsare usually more similar to each other compared to the flows of flashcrowds In this paper we are concentrating flashcrowd and DDoS there are two steps involved, first it is necessary to differentiate normal traffic and flashcrowd by using Flash Crowd Detection Algorithm. Second we have to differentiate flash crowd and DDoS b y using Flow Correlation Coefficient (FCC). By using this FCC value, algorithm proposed called Adaptive discrimination algorithm is used to detect the DDoS from the flash crowd event. And a sequenti al detection and packing al gorithm used t o det ect t he attacked packets and filt er it out.by using above mentioned algorithms we can improve the accuracy in filtering the attacked packets and also the time consummation is reduced. KEYWORDS DDoS attacks, flashcrowd event, discrimination. I. INTRODUCTION A network is a group ofor two or more computer systems linked together. There are many types of computernetworks are available. Communication between the systems are carried out by message passing, while passing message some types of attacks may occur to collapse the actual message. The attacks are classified as two types they are Active and Passive. An "active attack" tries to change system resource. A "passive attack" tries to learn or make use of information from the system but does not affect system resources(e.g., see: wiretapping). we are concentrating on Active attacks.our focus is DDoS (Distributed Denial of Service Attack) it is one type of active attack. DDoS stands for Distributed Denial of Service attack. It is a form of attack where a lot of zombie computers (infected computers that are under the control of the attacker) are used to either directly or indirectly to flood the targeted server(s) victim, with a huge amount of information and choke it in order to prevent legitimate users from accessing them (mostly web servers that host websites). In most cases, the owners of the zombie computers may not know that they are being utilized by attackers. In some cases, there is only a periodic flooding of web servers with huge traffic in order to degrade the service, instead of taking it down completely. 2 Inrecent days DDoS is one of the main threats in the internet. there are many solutions have been proposed but still there is a problem in the internet world for that we are proposing an efficient algorithm to detect the attack and also filtering the attacked packets.in general computing environment, a denial-of-service attack (DoS attack) or distributed denial-of-service attack (DDoS attack) is an attempt to make a machine or network resource unavailable to the legitimate (actual) users. Types of DDoS attacks are Consumption of computational resources Disruption of configuration information Disruption of physical network components Current DDoS attack remains a high security threat to IT security on the Internet. The attacks are carried out by attack tools, worms, and botnet with the help of attack variants of packet transmission such as TCP/SYN, UDP and HTTP request floods . These are the sources of DDoSattack. They are powerful and can crush any server and host. Now the mainchallenges for DDoS attack detection areflash-crowd attack. Flash-crowd attack  is the phenomenon of a high dense of illegitimate packets from attack sources. The attack traffic is viewed the same as legitimate users traffics (called flash crowd). Attack sources pretend to be real users and pump a large volume of request packets that flood the target victim. In this case, the defense/detection system could be beaten and the server has difficulty surviving the attack which causes it to crush or degrade the servers performance. Statistical-based defense systems  against DDoS attacks based on header information from IP packets such as IP address, time-to-live (TTL), protocol type (port number), etc. The detection can discriminate normal traffic from abnormal traffic which is more likely to be an attack. However, some botnets, e.g. Mydoomcan bypass detection approaches through the victim. This is because the approaches consider the Transport layer and/or Network layer. Therefore, the botnets which generate similar legitimate HTTP packets can avoid detection. Even though the attacking HTTP traffic isaggregated, they still look like flash crowd. Heuristic-based defense systems  against DDoS attack based on the threshold value. Each approach may need to calculate its own threshold value to critic the current observing traffic. The drawback of heuristic detection approaches is their inability to consider legitimate traffic mixed with attacking traffic. Hence, packets from legitimate users may be blocked or eliminated during attack incidents occur. 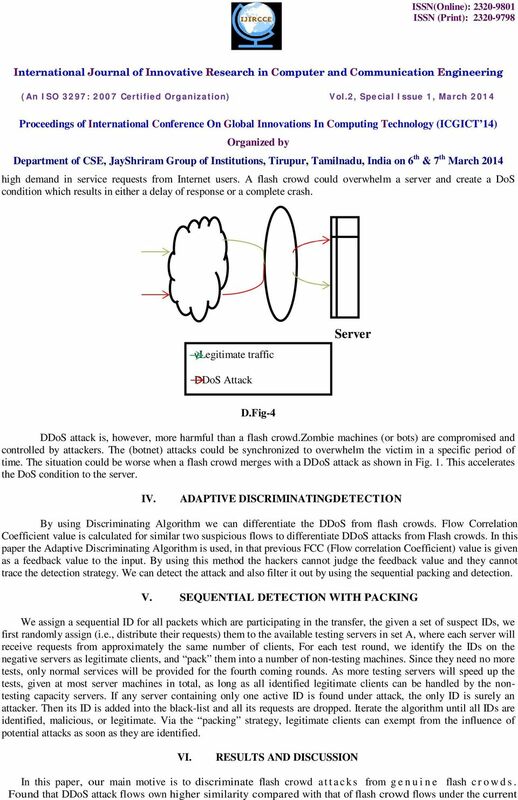 In this paper we propose solution to detect the traffic pattern of the packet by perceiving packet arrivals.proposed technique is an effective method to discriminate packets among DDoS attack sources and actual users.. The packets from the attack sources must be eliminated, but the user packets must get through the server. The contributions of the paper are listed as follows Fast detection: The system must be able to detect the DDoS attacks in time. Reliability: The system must not causefalse positive and false negative in results. Accuracy: The system must be able to respond as soon as the flash-crowd traffic arrives at the server. Flexibility: The system must be able to detect all form of attack packets such as malformed IP, TCP, UDP, ICMP, etc. 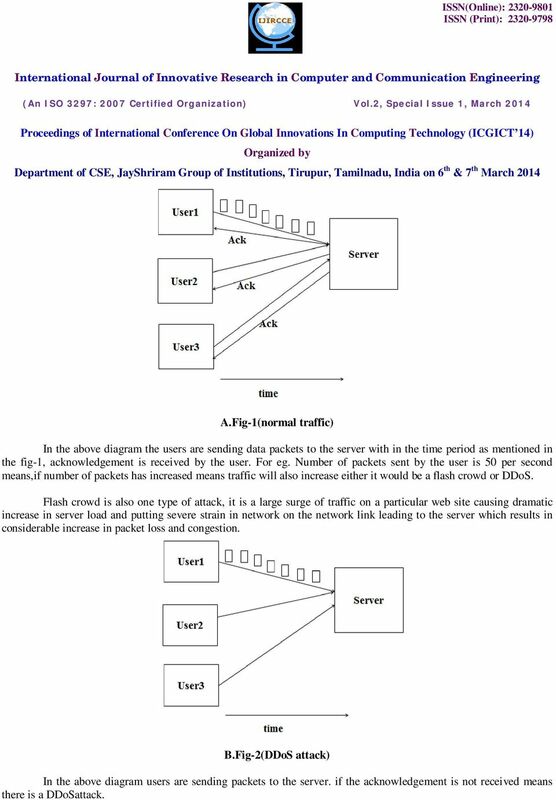 3 A.Fig-1(normal traffic) In the above diagram the users are sending data packets to the server with in the time period as mentioned in the fig-1, acknowledgement is received by the user. For eg. Number of packets sent by the user is 50 per second means,if number of packets has increased means traffic will also increase either it would be a flash crowd or DDoS. Flash crowd is also one type of attack, it is a large surge of traffic on a particular web site causing dramatic increase in server load and putting severe strain in network on the network link leading to the server which results in considerable increase in packet loss and congestion. B.Fig-2(DDoS attack) In the above diagram users are sending packets to the server. if the acknowledgement is not received means there is a DDoSattack. 6 conditions of botnet size and organization. We used t he flow correlation coefficient as a metric to measure the similarity among suspicious flows to differentiate DDoS attacks from genuine flash crowds. We theoretically proved the feasibility of the proposed detection method. Future work isto investigate thep o s s i b i l i t y oforganizing asuperbotnet, which hasasufficientlylargenumberoflivebotstobeatthe proposedmethod. REFERENCES  Ke Li, Wanlei Zhou, Ping Li, and Jianwen Liu, Distinguishing DDoS Attacks from Flash Crowds Using Probability Metrics, IEEE Third International Conference on Network and System Security 2009,pages  Shui Yu, TheerasakThapngam, Jianwen Liu, Su Wei and WanleiZhou,DiscriminatingDDoS Flows from Flash Crowds Using Information Distance, IEEE Third International Conference on Network and System Security,2009, pages  TheerasakThapngam, Shui Yu, Wanlei Zhou and GlebBeliakov,DiscriminatingDDoS Attack Traffic from Flash Crowd through Packet Arrival Patterns, The First IEEE International Workshop on Security in Computers, Networking and Communications,2011,pages  Jie Wang, Raphael C.W. Phan, John N. Whitley and David J. Parish,DDoS Attacks Traffic and Flash Crowds Traffic Simulation with a Hardware Test Center Platform, IEEE  Y. Xie and S.Z. Yu, A Large-Scale Hidden Semi-Markov Model for Anomaly Detection on User Browsing Behaviors Networking, IEEE/ACM Transactions on Networking, vol. 17, no. 1, pp , February  G. Oikonomou and J. Mirkovic, Modeling Human Behavior for Defense against Flash-Crowd Attacks, in Proceedings of IEEEInternational Conference on Communications 2009 (ICC '09), pp. 1-6, 11 August  L. Feinstein, D. Schnackenberg R. alupari and D. Kindred, Statistical Approaches to DDoS Attack Detection and Response, in Proceedings of the DARPA Information Survivability Conference and Exposition, vol1, IEEE CS Press, April 2003, pp  S. Yu, T. Thapngam, J. Liu, S. Wei and W. Zhou, Discriminating DDoS Flows from Flash Crowds Using Information Distance, in Proceedings of the 3rd IEEE International Conference on Network and System Security,18-21 October 2009. 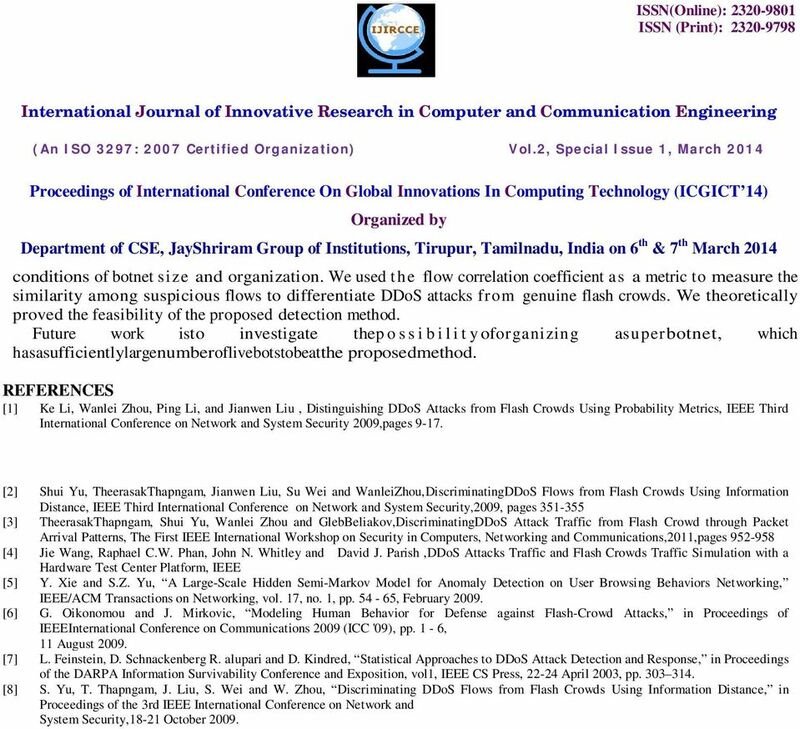 FLOW BASED MULTI FEATURE INFERENCE MODEL FOR DETECTION OF DDOS ATTACKS IN NETWORK IMMUNE SYSTEM 1 S.VASANTHI, 2 S.CHANDRASEKAR 1 Associate Professor/IT, Sona College of Technology, Salem, Tamil Nadu, INDIA.